The highland region in the Northwest of Vietnam is famous for spectacular landscape, wonderful villages of the ethnic groups, the rice terrace, and especially, the busy and unique markets. Let’s discover the most famous markets in this picturesque town with Vietfultravel, so that you will have a detailed look at the incredible culture of the locals here. Sapa is a must-visit destination when traveling to the Northwestern highland. In addition to paying a visit to popular tourist attractions, you should not forget to visit Sapa Market, which is also a common destination for Sapa tours. You can easily see a great number of handcrafted products made by ethnic groups at this market as well. 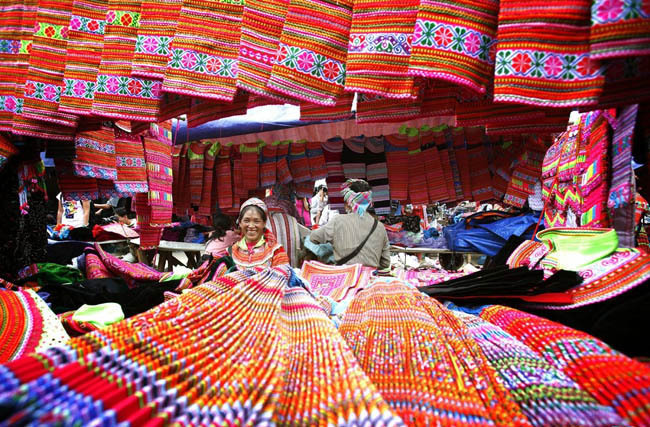 The most impressive feature of Sapa Market is its unique brocade products in vibrant colors, and subtle patterns of the H’Mong, Dao Do, and Giay. On the other hand, such products as fruits, vegetables, and spices are also favorite goods of tourists. It is irresistible to purchase some products as souvenirs for your friends and relatives once visiting this market. 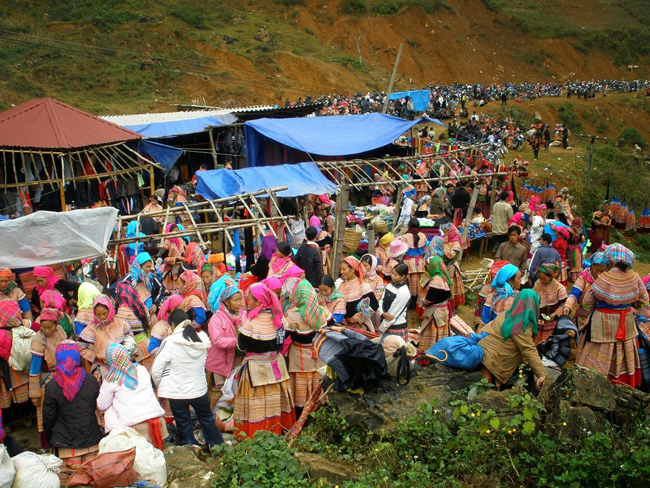 Bac Ha Market is located in Bac Ha District, Lao Cai Province, which is 70 kilometers from Sapa town. This market is regarded as the largest and the most colorful market in the Northwest region. You have to pass the beautiful valleys, go through tortuous paths to come to this market. For the ethnic groups, they have to wake up in the early morning or the night before to carefully prepare for their trading goods in the next morning. 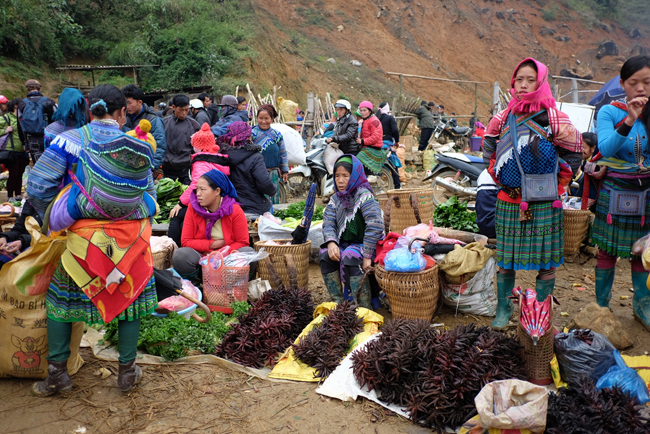 Bac Ha Market provides almost every products of the highland such as vegetables, foods, spices, plough, pick, and even the toothpick, and thread. The foods at this market are very special and delicious. It is a pity if you don’t try them. Drinking a cup of aromatic corn wine, or enjoying the hot “thang co” dish, etc. are must-do things when coming to Bac Ha Market. This market is a favorite destination for those who travel to Sapa. Located in Bat Xat District, Muong Hum Market only hold on Sunday every week. 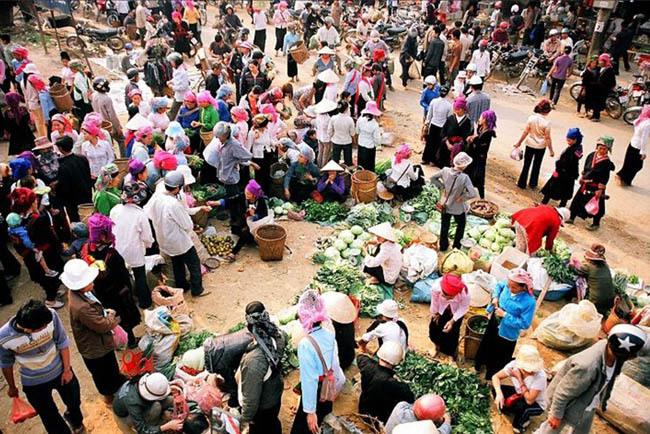 On Sunday, the market is as busy and excited as a large party of Ha Nhi, H’Mong, Giay, Dao Do and Dao Tuyen people. Because this market is located in a small valley with a lovely and gentle stream passing through, the scenery here is very spectacular and picturesque. You can easily catch sight of people and horse passing the viaducts endlessly in colorful and unique clothes of their community. This image is so lively that you may want to take a beautiful photo immediately. The girls and the kids wear the most beautiful clothes, which not only impress the boys but the tourists as well. Can Cau Market is located in Can Cau Ward, Si Ma Cai District. This market is usually held along the streets, right under the spectacular rice terrace. The major traders of Can Cau Market are Mong Hoa and Giay people, however, the method of trading is the same as the Dao’s one. This market only opens on Saturday and Sunday every week. Can Cau Market is divided into separate areas. It also provides you with a wide range of products such as vegetables, herbs, spices, utensils, and brocade products. Besides, there are also many food stalls serving traditional dishes, which also attract a lot of locals and tourists. 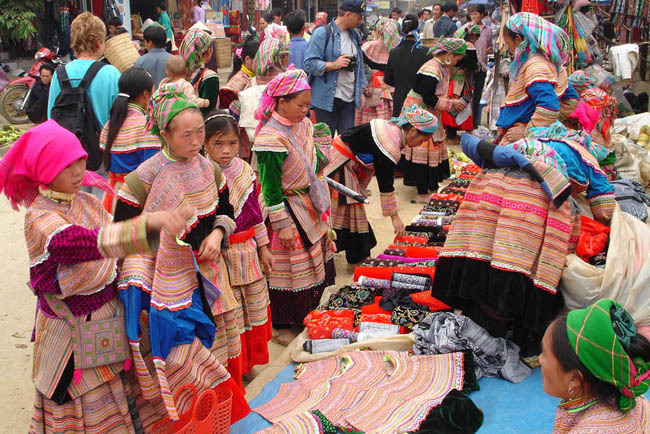 Coc Ly Market is a market of the ethnic groups, who is living in the Northwest of Bac Ha District, Lao Cai Province. This market is usually located near the viaducts passing through Chay River. It is only held on Tuesday every week. Coc Ly market is also divided into many separate areas. At this market, you can find products and goods, which are mainly specialties of the forest such as vegetables, herbs, Shiitake, Cloud ear fungus, honey, rice, utensils, necklace, ring, clothes and brocade products. All of them are displayed on the nylon canvas, which is placed on the ground. However, a unique feature of this market must be the areas for trading domestic fowls and cattle such as buffalo, cow, pig, chicken, dog, horse, and cat, etc. This area is always filled with the excitement and animation of sellers, customers, and visitors. On the other hand, the area for serving traditional foods of the ethnic groups is also very excited thanks to the harmonious combination of the fragrant smoke of grilled foods, the sounds of people chatting, the laughing of friendly people. You cannot resist to this appealing attraction. On passing by this area, you should take a rest, sit down and enjoy the delicious local foods as a must-do thing. Cao Son Market is located in Cao Son ward, Muong Khuong District, Lao Cai Province, which is about 80 kilometers from Lao Cai City. The main traders of Cao Son Market are the Mong, Phu La, Dao and Han Den people. 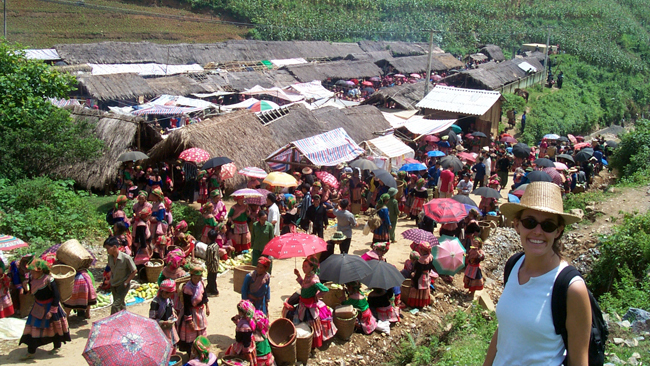 Those ethnic groups majorly live in the four biggest villages of Muong Khuong District. Each week, the market is held on Wednesday. From the early morning of Wednesday each week, you can easily catch sight of people from many places coming here to trade goods and foods. They usually go in groups, in pairs and sometimes, go alone. Some people wear the “gui” (a large basket) on their back, some use the horse to carry the goods while some go to Cao Son Market by motorbikes or bicycles. The Mong and Dao girls are lovely and pretty in colorful clothes and umbrella with elegant, subtle patterns. All of these create such a spectacular and lively image that you will never forget. On coming to Cao Son Market, you are offered the opportunity to enjoy the cultural combination of ethnic groups near Chay River, Muong Khuong District. Besides, you can also enjoy a cruise on Chai River to enjoy the beautiful scenery along the riverbank. We hope that through this post, you can find some useful information and beautiful places to note in your list of thing-to-do when traveling to the Northwest of Vietnam. We ensure that you will have a memorable and enjoyable time at those destinations. Finally, we wish you a happy and safety trip!